Dear, Simon and Saskia, sponsors, members of the board and facebook friends. How is it going (life)? I just got my 11th class results. I am pass with 72%. I will send you the picture of my result sheet. I already started my 12th class. It's a little hard to believe that I am in the final year of my school life. We have music classes for sometimes, I am learning how to play guitar during my music class. There are few choices between guitar, piano, singing, and dancing. It's fun! Football is going great. Our school coach planned a very busy schedule for us this year. There will be more than five tournaments, which will be organised by our school only. They includes two national level tournaments which will be held in our school. It's exciting. Our soccer practice also changed. Earlier we practiced in the morning. Now, we are practicing in the evening to spend more time playing and to give the best result. I bought soccer shoes,they are really comfortable. Thanks. I have sent you my pictures and a click of my report card sheet. I am in sector 40, everybody seems great. Disket and Dolkar had economics paper today. Poor girls, have to stick with books all the time. Haha. Take care and thanks for everything. 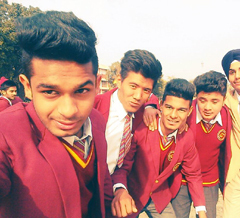 These are my school soccer mates, this picture is taken at the farewell party. 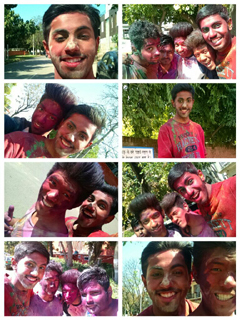 These are the clicks of Holi ( the festival of colors). 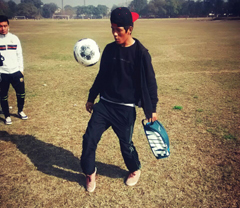 This one is taken at the sector 11 football ground. Contact met de kinderen in Chandigarh (4). Deze foto's zijn me opgestuurd door Dechen (17-10-2014). Met betrekking tot de groepsfoto's: ze gaan over een uitstapje naar een bioscoop in de Elanta mall (Chandigarh). 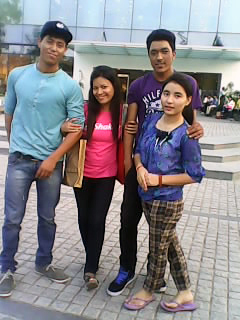 Rigzin, Angmo, Diskit, Dechen, Dolkar and Lobzang in front of the Elanta Mall in Chandigarh, after a visit to the cinema. 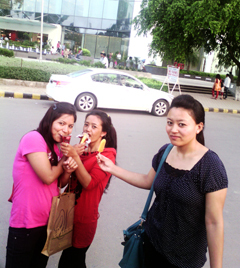 1st picture: Rigzin, Dechen, Lobzang and Dolkar; 2nd picture: Dechen, Diskit and Angmo in front of the Elanta Mall in Chandigarh, enjoying an ice cream. 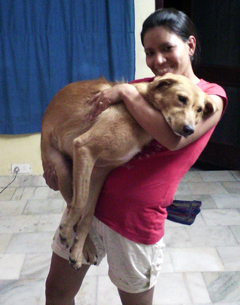 Dechen with Zeerah in her arms. Contact met de kinderen in Chandigarh (3). 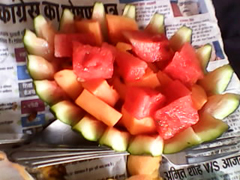 Dechen has decorated the watermelon that we had for desert. She has copied this decoration from a video she watched. 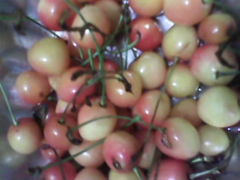 The other day one of my friends came from Zanskar and brought us Kashmiri cherries. They look like not ripe but they taste very sweet. Everyone liked them. 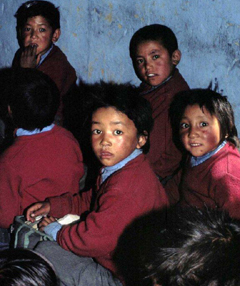 This is the picture of my childhood when I was in Lamdon School, my sponsor took this picture. 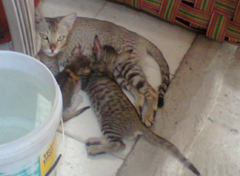 We found a cat in sector 15 and she has three small kitten. One is very weak you can see. 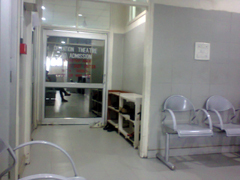 Contact met de kinderen in Chandigarh (2). 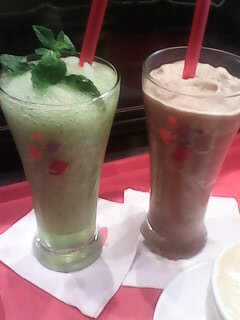 Today I made these: one is called Green Apple meltdown and the 2nd one Tropical ice berg. 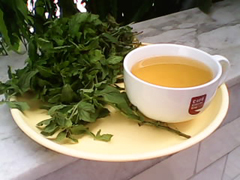 This is our morning lemon tea and mint. I made lemon tea for all our family members. This is one of the four front patio plants, nicely blooming. I took the picture at 6:30 am. 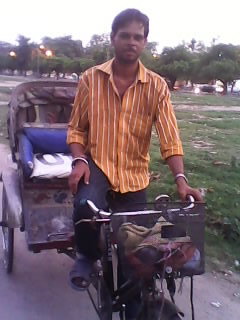 He is a rikshaw wallah, named RAJU. Dinah is ready for his morning walk. Ik heb regelmatig contact met de kinderen (via Skype en) via e-mail, soms met een vraag, of een kleine opdracht: bijv., het maken van wat foto's, het schrijven van een verhaaltje. 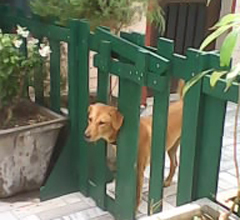 Zeera is trying to get outside, because she wants to play with her mates, the stray dogs that have their territorium nearby. 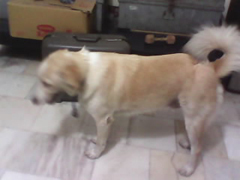 Zeera has to wait till it's stray-time for her. She is kept inside during certain hours of the day. We had to agree with the neighbours on that topic. The plant in the pot on the right is growing fast but thin as you can see. 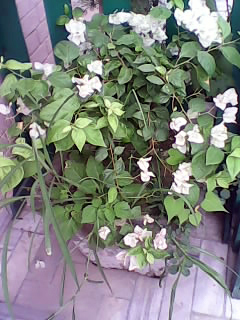 The plant in the left pot is growing slow but is blooming. The plant was not blooming when you (Simon) were still here in March. 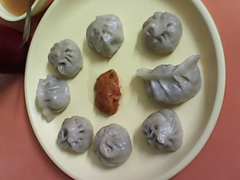 The eight things that you see on the plate are called momos, which is traditional food of Ladakh. We all had a good meal. 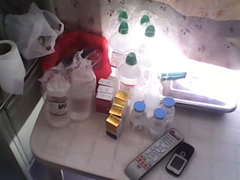 In this picture you can see my stuff, when I was in Hospital. All these things helped me to recover and make me happy. It's all glucose. After the operation, they just injected me with glucose for 2 days. Filmpje over onze groenteverkoper Nathi Ram (gemaakt in april 2011).